Immerse yourself in the simple pleasures of the outdoors without sacrificing comfort or style. 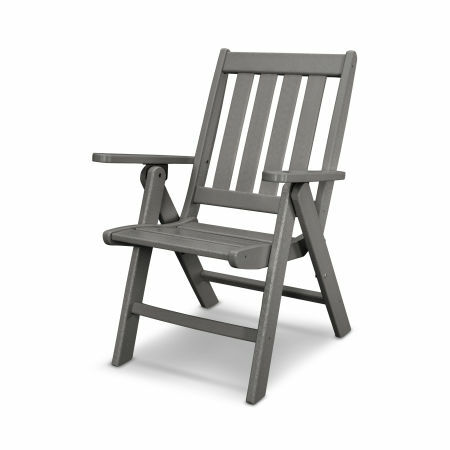 Chow down, share some stories, or stretch out in durable POLYWOOD® outdoor dining chairs and benches. Our extensive collection of outdoor dining chairs and outdoor dining benches gives you endless options for eating alfresco. Combining stylish designs with warm colors and craftsmanship, POLYWOOD® outdoor dining chairs and benches are the best way to transport your dinner party into the great outdoors. Every deck, patio, and backyard is completely unique. We understand that your outdoor furniture must withstand the elements but also bring your existing design elements to life. You’ll find the exact combination of POLYWOOD outdoor dining chairs and benches to instill your space with functionality and fashion whether you’re looking for a traditional design or you prefer the clean, sleek lines of a modern aesthetic. Choose between side chairs, dining chairs, swivel chairs, folding chairs, and benches from many of our most popular collections, including outdoor dining furniture from our Metro, Coastal, Bayline, Euro, Nautical, Long Island, Palm Coast, and Seashell Collections. Pair our all-weather dining chairs with a POLYWOOD outdoor dining table and you’ve created a gathering space to share food, laughter, conversation, and memories. All of our dining chairs are built to last, constructed with extremely durable HDPE lumber to maintain their appearance and stability for generations. Our outdoor furniture is naturally durable and weather resistant, holding up to salty sea air, high winds, torrential rain, and substantial snow without cracking, rotting, splitting, or peeling. 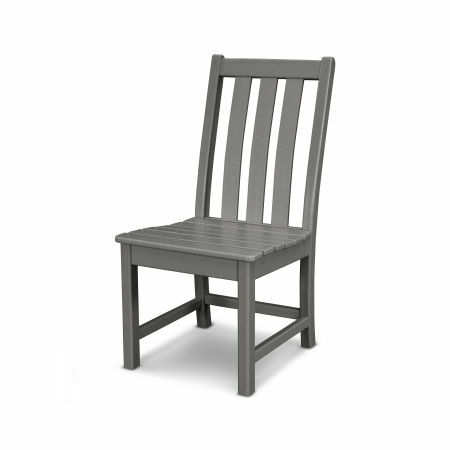 When you seek rugged dependability and timeless style the only choice is POLYWOOD outdoor dining furniture. Available in a variety of vibrant colors, neutral hues, and earth tones that extend all the way through the lumber, our outdoor dining furniture can match or complement the color scheme of any porch or poolside cabana. Our signature Color-Stay Technology assures each dining chair or bench will look beautiful years after purchase. When you invest in durable POLYWOOD outdoor dining furniture maintenance is an absolute breeze. You’ll only need to occasionally clean your chairs and benches to wipe away built-up grime, which you can easily do with a damp cloth, water, and a mild soap. A few minutes of cleaning and your favorite outdoor dining furniture will look as pristine as the day you bought it. Take the celebration outside — whether it’s a birthday, anniversary, or national holiday our dining chairs let you enjoy it in comfort and elegance. Serve up some delicious food and raise a glass to toast to the occasion. Share a hearty meal with friends and segue into the gentle ease of talking late into the night with POLYWOOD outdoor dining chairs. No matter what style you choose our dining chairs are contoured for optimal comfort so the hours will just slip away full of conversation and laughter. Fire up the grill and prepare the marinade, it’s barbeque time! Gather together to enjoy the beautiful weather and simple pleasures of eating outside. With enough POLYWOOD dining chairs everyone has a comfortable spot to sit. You never need to worry about errant barbeque sauce either — all POLYWOOD furniture is stain resistant. A sturdy, weatherproof bench can transform a garden, but often when shopping for outdoor dining chairs you want a matching outdoor dining table to accompany it. Instead of mixing and matching styles take a look at our comprehensive guide to buying an outdoor dining set on the POLYWOOD blog for tips on getting everything you need in one simple purchase.